It occurred to me to keep a running list on a sidebar of current projects but the very thought of that also kind of makes my head hurt. Because my favorite part of projects is starting a new one. We will see, maybe it would be a wake-up call for me and help me focus. HA HA HA HA! I think we all know better than that. 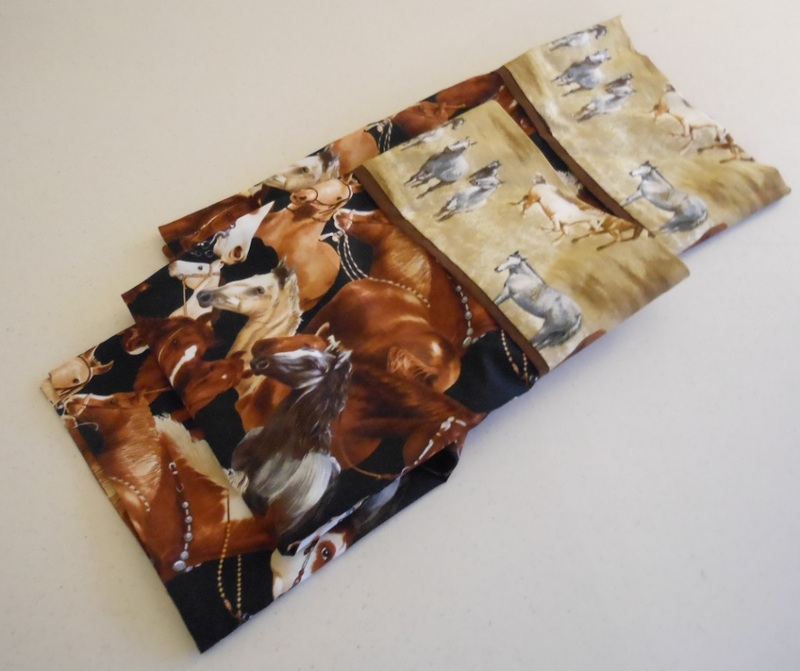 My niece prompted me to put up pictures of the horse pillowcases I made for her younger sister. I actually made four pillowcases, two for T. for her birthday, and then I thought as long as I was making two, might as well make four, so I made two for the Folsom Bazaar (October) as well. I used the method here at The Twiddletails Blog, it was the first time for me to use French seams, so I learned something as well. These were fun! If any more nieces and nephews want fun pillowcases, I am ready to go! 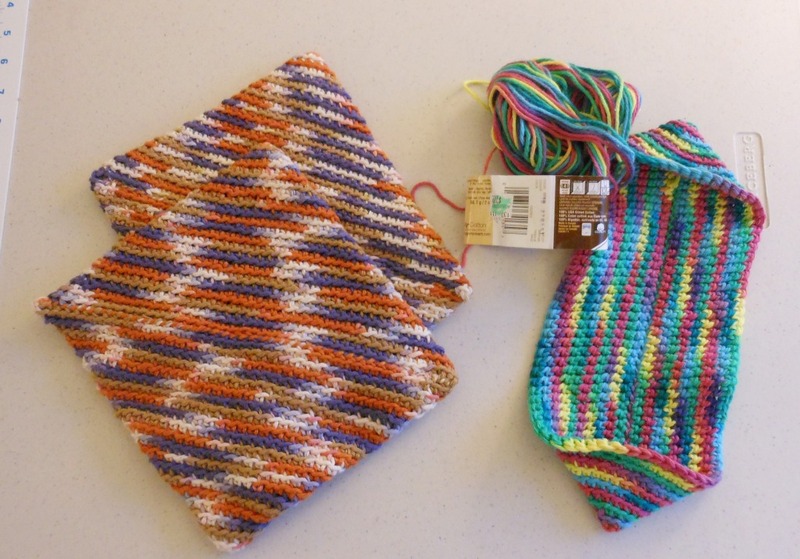 I am ALWAYS working on at least one pair of these potholders (method at Mielke’s Fiber Arts, LLC). 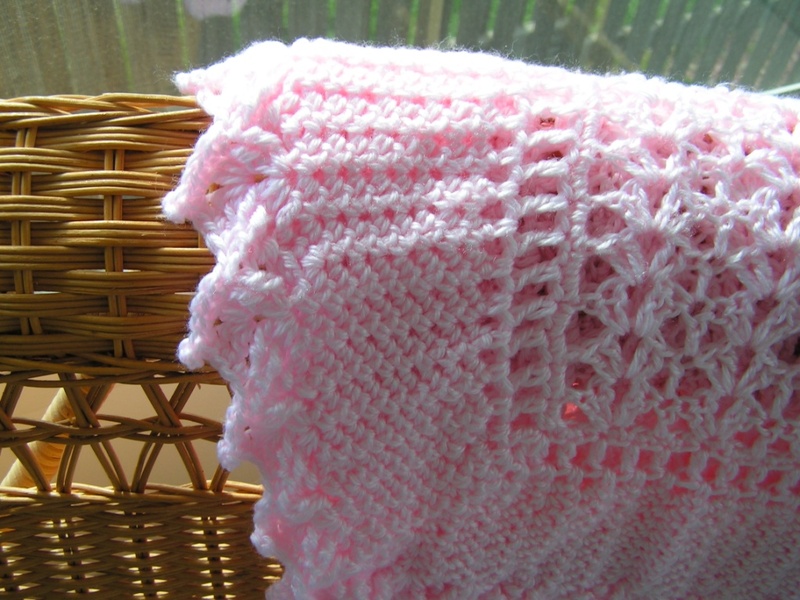 Grandma Clarice used to make these, and they are great, thick potholders. I have used cotton yarn, acrylic, double thickness of acrylic, they all work, just create different textures and thicknesses. These are both cotton. I vary the size of the initial chain depending on the thickness of the yarn. I think I can say that almost everyone who has received a pair of these thinks they are great. They are very durable. Unless you melt them on a burner (don’t ask). 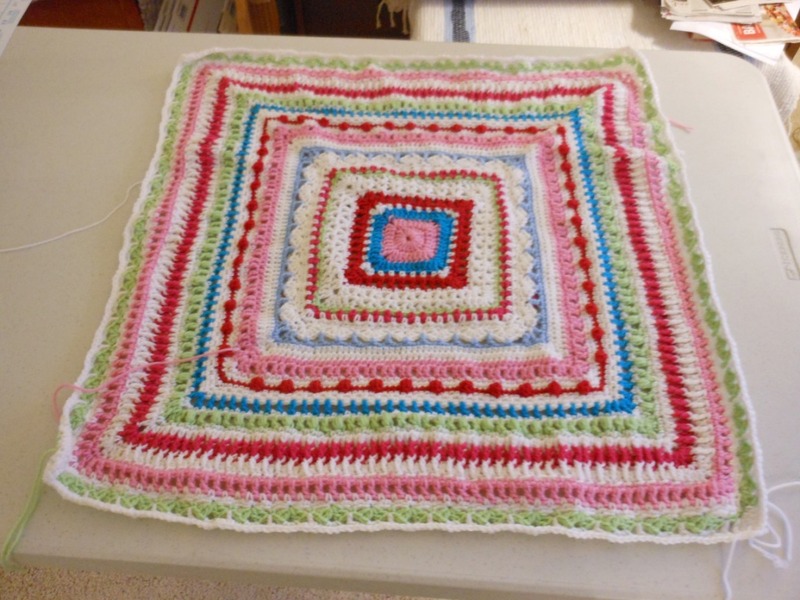 Here is the second afghan in the works for baby niece L. This pattern is a free pattern from Bizzy Crochet: Faeries Sampler. It is beautiful, but lots of errata, and you should read her blog entry and the comments on it too to pick up some further errata. 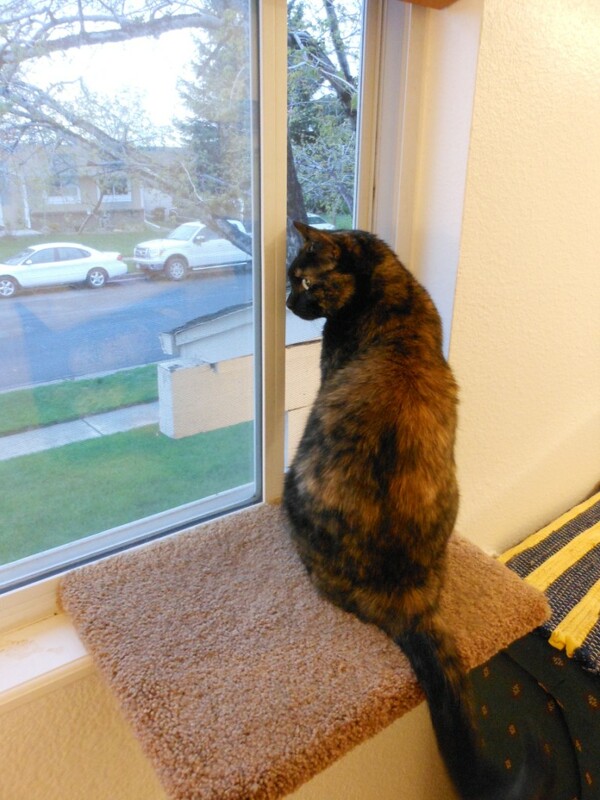 I still have several rows to go. I swore I wasn’t going to do Camp Loopy again but my resistance is weak. I have noticed that I like to purchase knitting books, but I don’t actually knit patterns from them very often. So I have made myself a mental promise not to buy another book until I knit a pattern out of one of my existing books. So I am going to use Camp Loopy for that purpose. 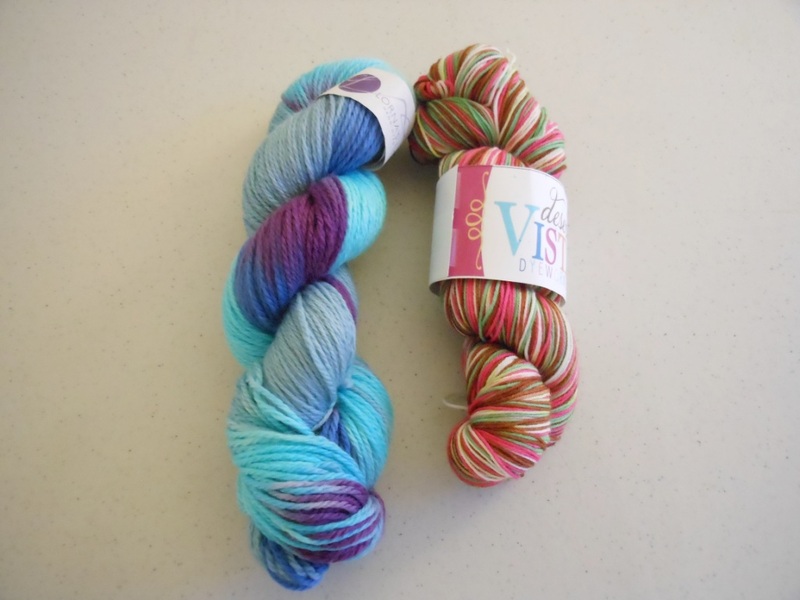 I am going to use this to knit the Lifted Stitch Scarf by Carol Scott from the Sock Yarn One-Skein Wonders book, using this yarn, Desert Vista Dyeworks – Viso Self-Striping in the colorway Spumoni (right). Of course, this is going to have the result of making me want to eat Spumoni. I spend a lot of time in a car in June, going to various meetings, (not driving! ), so I think this will be a good car project. I hope. And I will be on the Eastern Plains of Colorado, where Spumoni sources are few and far between, so perhaps that will be safe. With the yarn on the left, Lorna’s Laces – Shepherd Worsted, colorway River, I am going to make the Twisted Spiral Neckscarf by Judy Warde, from the book One-Skein Wonders, Yarn Shop Favorites. (Purchased both of these from Loopy Ewe, which is about 2 miles from my workplace, which is a dangerous thing.) So that will be another pattern from a book! That means I can buy two new books, correct? But wait, there’s more. 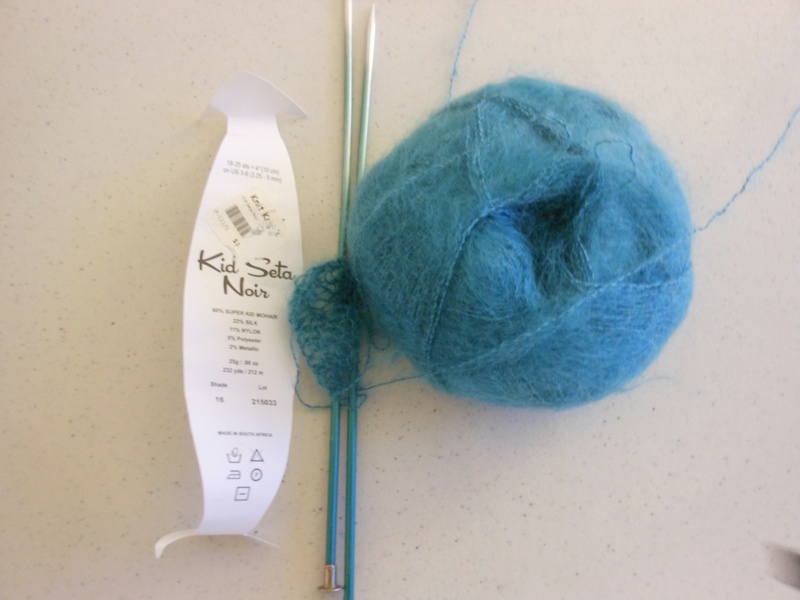 I also bought this teal Kid Seta Noir (at Knit Knack), to make the Lace Spiral Scarf by Gail Owens, from Designer One-Skein Wonders. This is NOT going to be a good car project, as there are yarn-overs, and then knitting into the yarn-overs with this tiny, tiny yarn, and somewhat larger needles to make it lacy, so I am anticipating this will be a challenge. So I have three projects from three different books! That should mean I get to buy three more books, yes? Well, maybe I should stipulate that I should knit three patterns from books to buy a new book. Or two? Or five? It is hard when you are grown-up and have to make up your own rules. I have problems with how many popsicles I am allowed to have each day as well. And here is a picture of a little cat, who looks so innocent, but went on, later in the night, to knock over the very nice flower arrangement that Ken got me, spilling water all over the table, narrowly missing the netbook computer. Grrrrrrrrrrr.